All XfrogPlants are verified to work in Carbon Scatter for Cinema4D, 3ds max, and Maya. 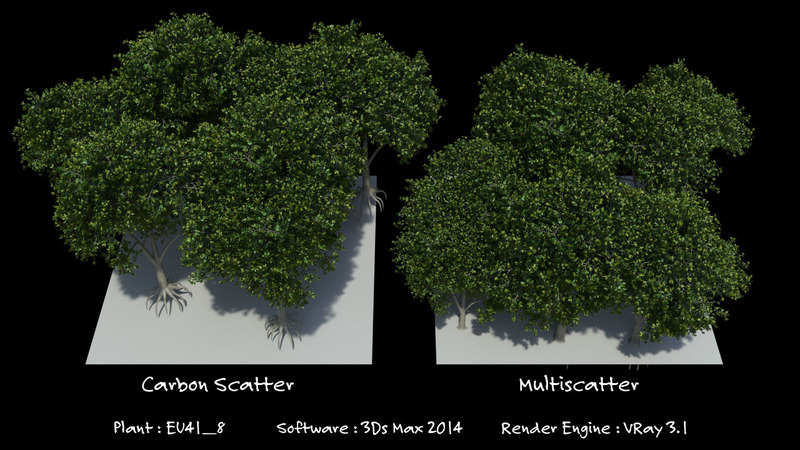 Carbon Scatter work on a proxy based workflow, i.e it seems to take in the objects (if geometry) and convert them into proxies and then distribute them. Re-linking the proxy shader to the assigned materials. Substituting the CS shader by the proxy shader inside CS. Populating the scene as desired. In-short, use the proxies just as you normally would and then add them into CS and then change the shader to the VRay Proxy Shader. Check if the tree renders all by itself – ie open up the tree file and see if it is rendering. Import the tree into your CS scene and see if it renders by itself (before adding into an ecosystem). If you are working with proxies, then check if the proxy geo and the proxy shader (if applicable) are connected properly. Try converting texture path to “absolute” and then see if it is rendering.